Bike fest at Jack London Square. 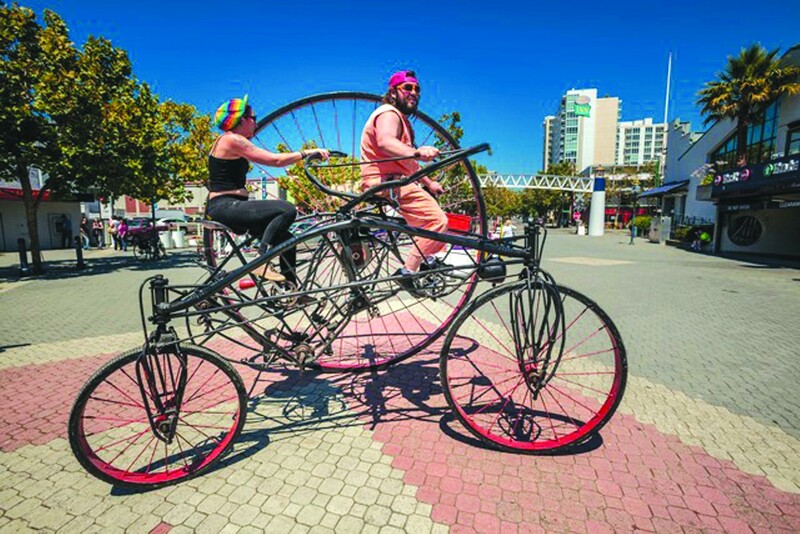 The ever-popular Pedalfest will be back at Jack London Square (Embarcadero West, Oakland) on July 23, offering another year of bikecentric activities from 11 a.m.–6 p.m. The free annual event typically draws thousands of bike lovers to the waterfront for attractions like The Drome, a 30-foot banked wooden velodrome featuring cycling daredevils performing stunts. This year also features an amphibious bike race that starts off on land and continues into the Oakland Esturary; a Karaoke Rickshaw that allows attendees to sing their heart out while being pedaled around the fair; and art bike welding demonstrations, among a packed schedule of other activities. Of course, as at any festival, there will be musical performances, food, and a beer garden as well. The only obstacle may be finding a bare pole to hitch your ride to — but they’ve probably got an innovative bike parking invention ready for that.